As Skittles Commercial: The Broadway Musical played its sole performance on Sunday afternoon at New York’s Town Hall, it wasn’t difficult to imagine that somewhere, the late Stan Freberg was smiling. Freberg was a popular audio satirist in the late 1950s and early 1960s whose musical digs at pop culture included a nearly seven-minute takedown of holiday advertising titled Green Chri$tma$. His apotheosis came with the release of an original cast recording of a Broadway musical that didn’t, in fact, exist. He subsequently went into advertising and was at the forefront of using humour in adverts, including the coffee commercial called Omaha! – a parody of Oklahoma! – which ran for over six minutes. If Freberg and Eugene Ionesco had collaborated on a musical about a popular confectionary, the result would have been something like Skittles Commercial. Its authors were Nathaniel Lawler (book and lyrics), Will Eno (book) and Drew Gasparini (music). The work was created in response to the festival of advertising that punctuates the Super Bowl, the American football championship game that is typically the single most watched television event of the year. The single 30-minute performance, starring Michael C Hall as Michael C Hall, an actor starring in a Skittles commercial, was offered as a benefit for Broadway Cares/Equity Fights Aids. 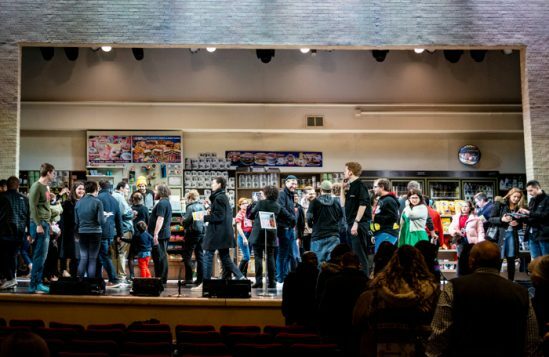 Even though people were paying to watch a marketing scheme crossbred with musical theatre, the proceeds all went to a good cause. It was endlessly absurdist and self-parodying, a meta-musical, meta-ad that assumed (correctly) that everyone was in on the joke. The 11 o’clock number was called Advertising Ruins Everything. It was a far cry from the exclusive immersive theatre project Behind the City, brewed up by Third Rail Projects for Macallan whisky last summer, where the show was bookended by stops at a scotch-themed bar, but otherwise bore no apparent traces of alcohol. 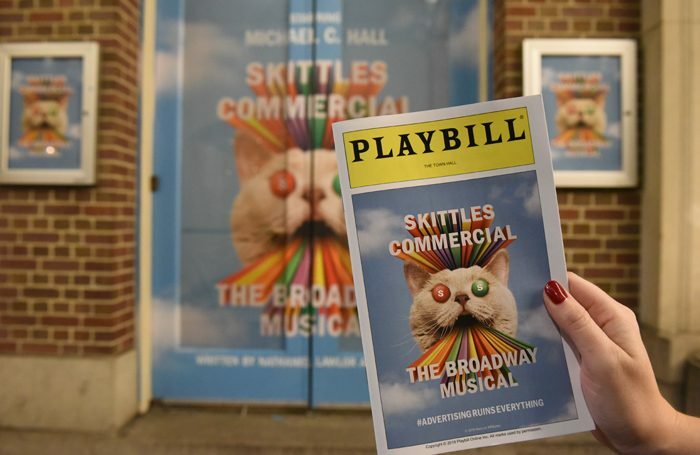 After its obvious debt to Freberg, the closest parallel to Skittles Commercial might be industrial musicals, original shows written by Broadway talent for marketing conventions of major brands, which had their heyday from the 1950s to the 1980s but which continue to this day. Products are placed in movies and TV shows to stealthily push their wares on the viewer (famously, ET sent Reese’s Pieces into the sales stratosphere). Now popular movies, more than ever, can earn more for their corporate owners when they are converted into stage musicals – and in a few cases back again into movies of the musicals. So was Skittles Commercial a metastasis or simply a logical progression into absurdity? I’d go with the latter, because while I didn’t come away humming the tunes (which are now available on digital platforms), it was certainly a singular theatrical experience that may linger in a way other shows haven’t. Will we see more sustained entertainments that manage to mingle product placement and existential despair, a trademark of Eno’s? It’s hard to imagine, but so was Skittles Commercial. The one thing that Skittles Commercial proved is that the kind of money spent on Super Bowl ads is more than enough to fuel theatre artists on a relatively large-scale show for a few weeks, a demonstration of economic perspective that is sobering. 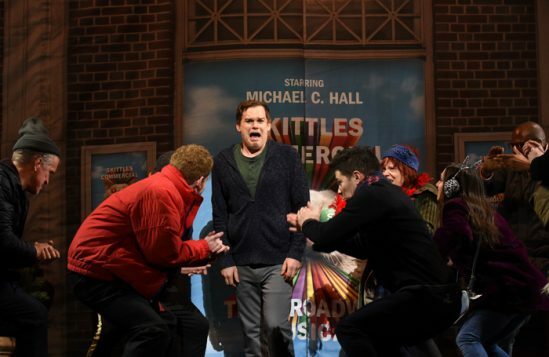 It’s worth mentioning that Skittles Commercial: The Broadway Musical didn’t actually play on Broadway, as Town Hall is a concert venue, not a Broadway-designated house. But surely that’s all part of the joke. And by writing this column, I’ve advanced the Skittles brand. So who’s got the last laugh now? 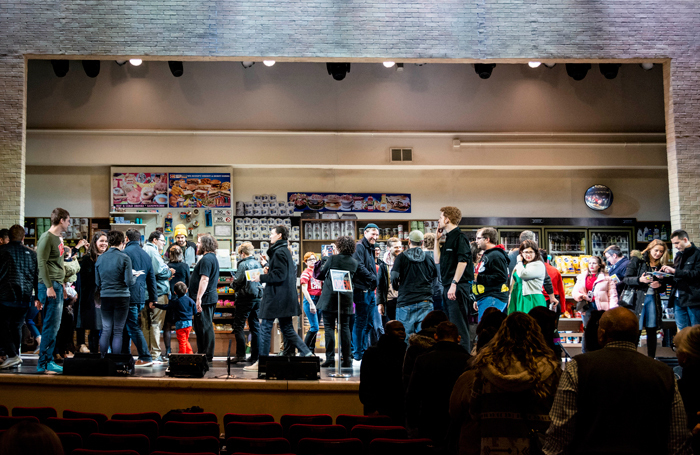 Howard Sherman: Is Scotch sponsorship in the spirit of theatre? Expert box-set musical book-writer Rick Elice mines UK pop hits of the 1960s for the new musical My Very Own British Invasion, premiering Sunday at Paper Mill Playhouse in New Jersey. Jerry Mitchell directs and choreographs the show, based on the life of Peter Noone of Herman’s Hermits. Off-Broadway’s Classic Stage Company opens its alternating productions of Strindberg on Sunday, with Yael Farber’s Mies Julie alternating with Conor McPherson version of The Dance of Death. The shows have separate casts and different directors (Shariffa Ali and Victoria Clark, respectively), but share set, lighting and sound designers. MCC Theatre officially opens its first permanent home on 52nd Street in New York on Sunday with the premiere of Loy A Webb’s The Light, a two-character drama. Logan Vaughan directs on the smaller of the two stages in the new venue; the larger stage opens later this month with the musical Alice by Heart.